More premises across Fife can now upgrade to faster fibre broadband through the £428 million Digital Scotland Superfast Broadband rollout. Thanks to the programme, more than 890,000 premises are able to connect to the new network, with more coverage now live across the Kingdom in places including Crail, Gauldry, Kirkcaldy, Cardenden, Anstruther and Newburgh. Local people need to sign up for the new, faster services with an internet service provider, as upgrades are not automatic. Thanks to additional investment as a result of innovation and new funding generated by stronger than expected take-up, the programme will deliver new DSSB deployment in every local authority area during 2018 and beyond, complementing ongoing commercial build across Scotland. 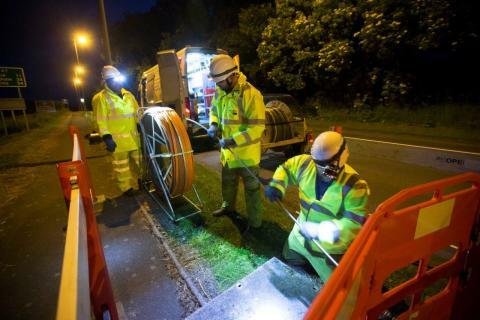 As part of the local rollout in Fife some ultrafast Fibre-to-the-Premises (FTTP) technology is being deployed. FTTP sees fibre connected directly from the exchange to the premise and is capable of carrying speeds of up to 1Gbps2. FTTP is being deployed by the programme in only a handful of areas where it is the best technical solution for the area. Rural Economy Secretary Fergus Ewing said: “I am pleased to see that more premises than ever before now have superfast broadband available to them. “I would encourage more people to check whether they are eligible to upgrade on the DSSB website and contact a service provider of their choice to start receiving faster broadband. Fife Council's Convener of Economy, Tourism, Strategic Planning and Transportation Committee Cllr Altany Craik said: “I am delighted that more areas across Fife can now access fibre broadband thanks to the programme and more people are now able to get a superfast speed. Whether you are downloading a box set, a small business making transactions or just keeping in touch with friends, fibre broadband can make it all happen easily." Robert Thorburn, Fibre Broadband Director for Openreach in Scotland, said: “As the rollout nears its end stages, we’re really digging into some harder-to-reach communities and places where the engineering challenges are more significant. “Many of these latest lines have been converted from a format once thought incompatible with high-speed fibre broadband, and we’re increasingly using ultrafast Fibre-to-the-Premises (FTTP) to deliver the network directly into individual dwellings, with some properties in places like Letham, Buckhaven, Luthrie, Strathmiglo and Newport-on-Tay among those to benefit. 1 and 2 These are the top wholesale speeds available over the Openreach networks to all service providers; speeds offered by service providers may vary. 2 FTTP is capable of delivering the fastest residential broadband speeds in the UK – up to 1Gbps. That’s around 24 times the UK average speed of 44Mbps (according to Ofcom) and enough to stream 200 HD Netflix movies simultaneously, based on Netflix internet connection speed requirements.